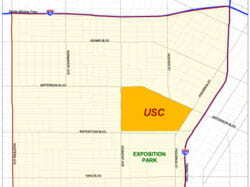 As a part of the university’s five-point neighborhood initiative, the University of Southern California presents the USC Neighborhood Homeownership Program (NHP). This program is available to all benefits-eligible employees to encourage them to purchase and occupy homes in the communities surrounding the University Park Campus and Health Sciences Campus. It was designed to provide employees the opportunity to purchase and own a home now. Benefit payments are considered income and will be taxed accordingly. Prospective buyers should check with their tax accountant to determine their personal tax consequences. Eligible employees may only receive one NHP subsidy. 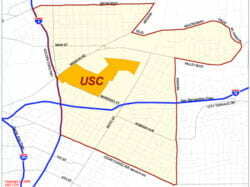 The University of Southern California reserves the right to alter or discontinue the USC Neighborhood Homeownership Program at any time. Faculty with an appointment of at least 50 percent time or more. The program only applies to homes purchased while employed by the university on or after July 1, 2006. It is suggested that the employee inform their realtor and lender of the availability of the USC NHP subsidy when starting the loan pre-approval process. The inclusion of the subsidy as “other income” may allow the employee to qualify for a larger loan amount or a more favorable interest rate as this subsidy does not require prepayment and is paid in equal monthly installments over seven years. Request a Neighborhood Homeownership Program Qualification Letter from the Real Estate & Asset Management Department. Provide the Program Qualification Letter to your realtor and lender so that the NHP subsidy is included as “other income” in your monthly gross income calculation. Submit a completed Neighborhood Homeownership Program Application and a certified copy of the final settlement statement (obtained from your escrow company) to the Real Estate & Asset Management Department after the close of escrow. Department personnel will send a Subsidy Agreement to the employee after the NHP Application has been approved. Employee signs the Subsidy Agreement and returns it to Real Estate & Asset Management Department. Download the NHP Application here. Applications can also be obtained in hard copy from the Benefits Office at 3720 S. Flower (CUB 2nd Floor) for University Park Campus or from the Personnel Department at 1975 Zonal Ave (KAM 409) at the Health Sciences Campus. For confirmation that a specific property is located within the defined program boundaries please see the maps below or contact the Real Estate & Asset Management Department. All home purchases in the University Park Campus Community, defined as the area bordered by Western Avenue to the west, the Santa Monica Freeway to the north, theHarbor Freeway to the east, and Vernon Avenue to the south, are eligible for this subsidy. All home purchases in the Health Sciences Campus Community, defined as the area bordered by the Golden State Freeway to the west, Broadway to the north, Indiana Street to the east, and Cesar Chavez Avenue (Brooklyn Avenue) to the south, are eligible for this subsidy.